Choose just the right elements for you! Here are a variety of Celtic and other pattern pieces to choose from. However, we can use patterns from any source, and of course, we specialize in Creating new designs, patterns and Styles. The bottom half of a ring mounting is called the shank. Any ring with a top and a bottom is considered to have a shank. Although Bands do not really have a shank, if there is a definable top to a ring, then the bottom is still called the shank. Of course, the focus of attention for most rings is the top, where the major stones and most visible elements are. The shank, however, is the foundation of the ring, takes lots of wear and tear, and adds detail and elegance to the ring. Most fingers are not truly round, so although round rings are the most common, a softly squared shank, or a shank with heavier corners sits better on the finger, and turns less. The shank is also the place where unusual detail can be added that may be meant to be less obvious to the world, and more visible, and personal to the wearer. Side face engraving, filigree or stones set in the shank can make a ring much more interesting in theside view you see everyday when you look at your hand at rest. Adding a split shank or a straight or curved taper to the shank will change the look and feel of a ring dramatically. Patterns can also be carved and cast into or even forming the shank, and the most dramatic rings have heavy or ornate shanks that are just as important as the top of the ring. The art of filigree consists of curling, twisting and bending fine threads of wire by hand. Complex filigree can have overlapping, very intricate elements. Although the basic idea seems simple, as the saying goes, it takes an hour to learn and a lifetime to master. Hand engraving is the finishing touch of many of our designs. 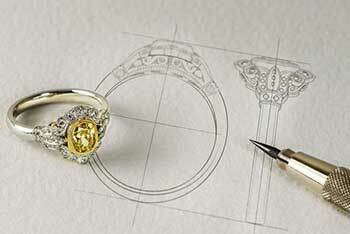 Considered by most to be the pinnacle of the jewelers' skills,that only the most talented jewelry artists perfect. Our Hand Engraving is done under a 10-30x bench microscope with carefully prepared and sharpened gravers. No machine lays out the pattern, and only extreme focus and skill allows for the creation of beautiful engraved patterns. The final stage of the production process includes adding texture and detailing if requested. There are many types of surface finishes used on jewelry, ranging from a high polish to a coarse hammered background.